100% Guaranteed to generate a lot of FUN! A fun night is scheduled at The Heritage Carousel. The event offers a family-friendly, wholesome activity at Des Moines’ only authentic carousel! No rental fees are paid for the use of the Carousel, thus no risk! All funds collected for the rides and activities associated with the evening are split 50/50 between the Carousel and the school or organization hosting the event. Who can schedule an event and when? Any school or non-profit organization can host such an event. March through November, as weather permits. During, before or after the Carousel’s public hours from Mid-May through August, or a combination of both. There are some restrictions during summer weekends, no restrictions on September weekends. Anytime the Carousel is not open to the public. To view Carousel hours click here. What will the Carousel do? The Carousel will provide the venue and operator at no charge. The Carousel will help promote the event through our website, Facebook, and using email notifications. A PDF of a personalized promotional flyer will be provided for you to email, print out, etc. and use to generate event interest. Picnic tables will be reserved for collecting money and for any extra sales activities used to generate income. What does your school or organization do? Your group works with the Carousel to select a date and time for the event. You decide if you want a simple outing consisting of Carousel rides and fun in the park or if you want to include a bake sale, picnic dinner, games in the park, festival, etc. or any other activity to generate income for your cause. 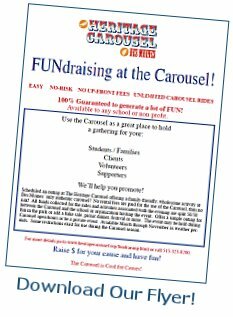 Your group promotes this fun activity to your families, friends, volunteers, clients, and anyone else who wants to support your cause and enjoy the Carousel. Your group provides 4 – 5 volunteers to directly assist at the Carousel: 2-3 to assist the operator in getting riders on and off the Carousel quickly so more rides can be given, 1 to accept donations, 1 to stamp the hands of riders who qualify for unlimited rides. Additional volunteers will be needed for any other events you choose to organize for the evening. Your group will need to provide a moneybox or other way to accept donations. For a suggested donation (we recommend a minimum of $5 per family), your supporters have access to unlimited rides on the Heritage Carousel. All persons who just happen to come to ride the Carousel during your event will be requested to either make the minimum suggested donation for unlimited rides or pay the regular riding fee per ride, which will also go toward the fundraising proceeds. (Carousel Season Pass holders who come to ride during open hours will not be required to make a donation but will be notified of your cause.) The income generated from the ride donations/fees and any other fundraising activities organized that evening is split 50/50 between your group and the Heritage Carousel. Carousel vending and merchandise will not be promoted during the event but any sales will be excluded from the fundraising proceeds. Not only do you raise funds for your group with this event, you raise FUN! The Carousel is a great place for families to have fun and spend time with friends. It is a hand-carved, hand painted work of art that turns to the music of an authentic band organ. It is enjoyed by persons of all ages. Union Park offers multi-age play equipment and large open spaces for group activities. These fundraising events not only support your group’s efforts but will help the Carousel, also a non-profit entity, remain available, affordable and able to continue making memories for children and families all around Central Iowa. To inquire about holding an event or check on an available date, click here.